And then there’s also the Concierge Service which connects you to a real person and apparently you can ask them about your location, and get them to answer curly questions like where’s good to eat or stay for the night. Again it’s nothing you couldn’t achieve via a quick Google search on your phone, but it does mean you can do it on the move. We tried it, and were connected with someone who we could understand perfectly well, even if she had a bit of trouble understanding us...but she supplied the info requested in a very courteous fashion. 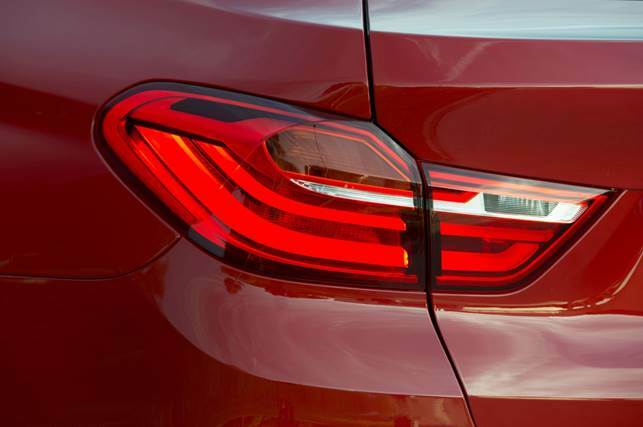 We guess it’s something a little extra to expect from your BMW ownership experience. You get a one-year subscription to the service included in the buying price, and your internet service is good for three years. It would be better if you could create a hot spot in the car enabling any non-3G-type device to go mobile and it does rely on cell coverage. In some parts of the West Coast you’ll get a ‘network not available, please try again later’ message. So it would have been useless had we actually needed it. Despite not having a smart key, the X4 comes well-appointed and we found the adaptive LED headlights highly effective, letting you travel more safely at night. They have a high beam assistant, dipping automatically when the camera detects oncoming lights. It all worked a treat until the rain arrived in earnest, and then we were blinding all the north-bound traffic. It would seem that such systems still depend on favourable weather conditions. Much of BMW’s active safety kit is left on the options list; not even a City Braking function is included. That’s a pity, given a Honda Jazz now offers this feature as standard. BMW has at least seen fit to include an array of cameras around the X4, as the rearward vision is awful. The Surround View system is much improved, displaying a seamless bird’s-eye view of your immediate surroundings. And we’ve gotten this far without mentioning the looks. Maybe it’s that we are used to the concept now but the X4 doesn’t seem as perverse and odd as when the X6 first dropped. The styling of that trail-blazing SUV Coupe was unloved by critics but it has nevertheless sold 250,000 globally and continues to go well in locales like China, Russia and the Middle East, places well known for their humility, fine taste and sense of style. 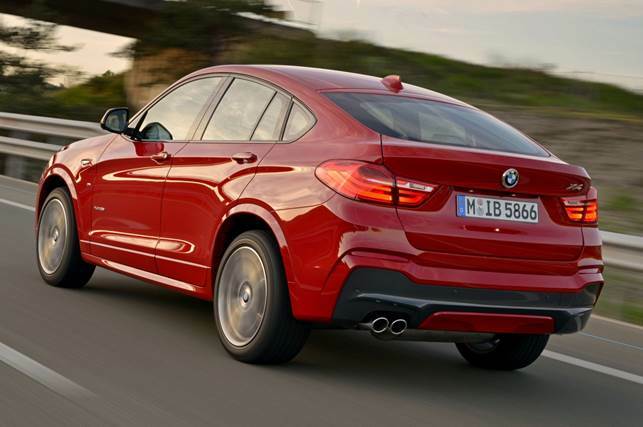 Anyhow, the X4 seems less of a visual shock, probably because it’s smaller than the X6, without such a huge bottom, although it still has that hunched look about it. 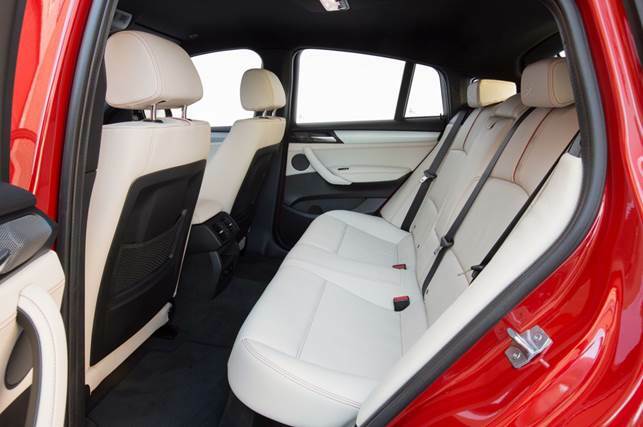 The X4 has a 4+1 cabin, the rear better than you’d imagine in terms of space, even for headroom. It’s the boot that suffers most from that plunging roofline, much of the usable space deleted by the slash of the designer’s pen. Despite that, there’s still some 500L under the tailgate, but bulky loads aren’t going to fit, even if you fold the rear seat. The tailgate is powered too, a little gimmick that seems popular with SUV buyers. Rivals include upstart Macan, which is cheaper but once you’ve added a few options to match the specification level of the X4 it’s more expensive. And the Macan owner can’t tick a power-up option to match the output of the 35d. The Macan has a more desirable form and badge though. The Range Rover Evoque is a better look too, and cheaper, though there are spec differences, including a deficit of power. So the X4 is therefore rather sound value in this little segment of the market, especially once you take into account BMW’s drive-away pricing and service and warranty schedule. The X4 is yet another seriously talented driver’s machine filling yet another niche to appeal to the folk that want something that little bit different. It’s too flashy for West Coasters but it’s a great carriage for the journey down it.